Tooth enamel is the hardest, most mineralized tissue in the human body. It had better be since it has to withstand tremendous stresses from biting and chewing. A study reported in Scientific American measured the biting force of 1,000 adult subjects with a device called a “gnathodynamometer”. Don’t try to pronounce that, you might break your teeth. The average bite force found was 171 lbs. Seventeen of the subjects had bite forces that maxed out the device at 275 lbs. This study also found that the subjects’ bite force was not limited by the strength of the jaw muscles, but by sensations of pain in the teeth. The subjects’ bodies were letting the researchers (and the subjects) know that the teeth are the weak link in the biting chain. People do break their teeth themselves, biting or chewing. Often the broken tooth had been weakened by wear, decay, a rebellious old filling, or previous trauma. Impact by all kinds of objects, from baseballs to dashboards, is an all-too-common tooth breaker. Athletes, especially in the contact sports like football, are at particular risk. The Central Casting hockey player is always missing a couple of front teeth. There are still people walking around who, in the age before twist-off, made a habit of opening soda bottles with their teeth. Few of these folks don’t show signs of that practice. A broken or cracked tooth can be more or less obvious depending on the extent of the damage and the level of pain caused. A craze line is perhaps the most benign type of structural defect in a tooth. These are vertical hairline cracks in the enamel, not actually a cracked tooth. They're harmless, though some find them unattractive. They're caused naturally by the everyday stresses of biting and chewing, by off-label use of the teeth for things like opening bottles, chewing pencils, nail-biting, and even by temperature changes. While not presenting an immediate oral health problem, it’s a good idea to consult a dentist about craze lines. They have the potential to open the door to more serious issues like decay, caries, root infection, and full-fledged cracked teeth. Treatment options include whitening for the cosmetic aspect, bonding for structure, and veneers. A full-fledged cracked tooth is much more serious than a craze line. It is an urgent dental health problem. Here, the crack opens from the enamel to the nerve, affecting the entire tooth. Strangely enough, you may not be able to see the crack in a tooth or feel it with your tongue. In fact, dentists sometimes have difficulty figuring out which tooth is cracked, because the patient’s pain can come and go. If you can see a crack in a tooth, or feel it with your tongue, you need to see a dentist as soon as possible. Erratic pain when chewing, or sudden pain when exposed to heat or to cold can be symptoms of other conditions, but these are also symptoms of a cracked tooth. Cracked teeth can be saved, but the sooner they're treated the more likely the patient is to have a good outcome. 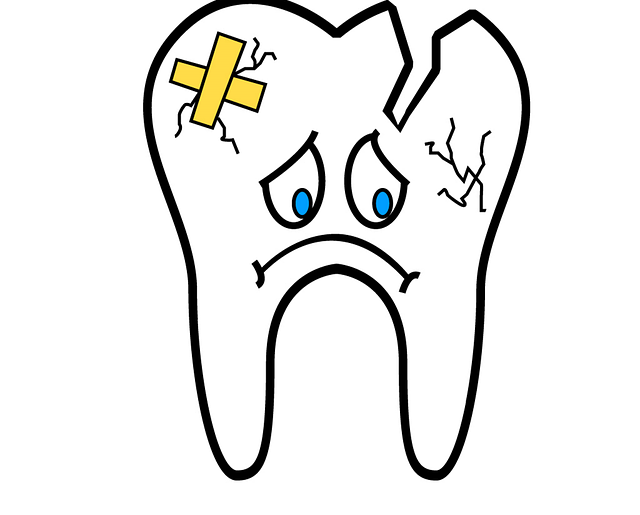 A good outcome after a cracked tooth is a good thing, because the bad outcome is loss of the tooth. A chip off the edge of a tooth ( did somebody try opening a blister package by biting it?) may or may not be painful, but it's usually pretty easy to detect. Sometimes the chip itself, falling onto your plate or providing a surprising crunch in a soft morsel, offers the first clue. The change in the shape of the affected tooth is something the tongue's sensitivity magnifies and usually makes quickly apparent. And then, it may hurt, especially if the dentin has been exposed or the nerve has been damaged. It may hurt a lot. Whether or not a chipped tooth hurts, though, its structural integrity has been compromised. Any breaches in the enamel offer entrée to bacteria to invade the inner soft tissues, causing infection and leading, unchecked, to loss of the tooth. A chipped tooth, like any fault in a tooth's enamel shield, calls for inspection by a dentist as soon as it can be arranged. Within a few days when there's no pain, on an emergency basis if the pain is significant. Treatment options for a chipped tooth depend on the size, location, and shape of the missing material, and on the overall status of the tooth. Minor chips with no signs of dentin exposure or internal infection can often be treated in one visit with a filling or bonding. Veneers are a possibility when the damage is to a front tooth and is cosmetic. When larger chunks have chipped off, a cap or a crown may be the solution, with root canal therapy as indicated. This will require multiple appointments over a few weeks. A full-out broken tooth is bad news. Here, the fracture extends below the gum line and in such cases, the tooth only rarely can be saved. Internal decay and the presence of large, old amalgam fillings are often the precedents of serious fractures, with biting or chewing as the straw that breaks the camel’s back. Pain is nearly certain if the tooth's nerve is still vital. The ultimate treatment, in this case, is extraction of the remaining tooth, and a dental implant. This is a surgical procedure in which a metal or crystalline frame, or base, is fitted into the jaw bone, and a crown is later attached to the implant. Implants are titanium alloy or a crystal form of the metal zirconium and need several months to fuse with the jaw bone after implant surgery. The crown cannot be attached until this fusion has completed. There are two tracks to responding to a broken tooth, or a suspected broken tooth, regardless of the severity. One is evaluating the urgency of dental care, the other is immediate relief of symptoms. As noted, any breach in the enamel of a tooth opens the way to progressively more serious problems and needs to be inspected by a dentist. The question, as a practical matter, is the urgency of a particular case. It’s a fork in the road, there are two ways to go. It may have to be treated as an emergency, in which case the dentist appointment should be as soon as possible. The same day. Now, even. Or, it could be merely urgent, in which case a few days’ delay is acceptable. Where significant pain is felt, the indicator swings to the emergency route. Until you can get to the dentist, manage pain and swelling with over-the-counter pain medication. Rinsing with tepid ( not cold, not hot) water or mouthwash can be helpful. If pain and/or swelling are not tamed by OTC medication, try applying an ice pack to the cheek adjacent to the affected tooth. There's no practical way to avoid all of life's surprises such as result in broken teeth. No one plans to catch a two-by-four in the mouth or have a bicycle accident. Those are the breaks. In too many cases, though, broken and cracked teeth are preventable. Neglect is the parent of the decay. Amalgam fillings past their expiration dates. Infections that weaken teeth and eventually leave them as camels' backs to the chicken bone waiting to play the straw. The best defenses are consistent home care, regular checkups, and self-referral when signs and symptoms are noticed.